A record of the event the GHG held on Sunday, September 7th, which turned out to be the last day for the house. About 25 mourners attended, plus cameramen from CityTV and Global. Impromptu but very good. We gather to mourn the passing of 1723 Napier (1922 – 2014.) It will soon fall to the wrecker’s ball, making way for million dollar homes. As friends and neighbours, we commemorate the life of this heritage building, which gave affordable shelter to artists and those of more modest means. Such places are of an increasingly rare breed in East Van. And so we mourn the passing of our community as well. At times like this we take solace in scripture. John 14:2 tells us: “my father’s house has many rooms.” And so did this rooming house off Commercial Drive — seven bedrooms and two suites at about $500 each — an example of density before it was a buzzword on the tongues of City planners. The duplex that will rise in its place will have room for only two, wealthy households. “Density,” brothers and sisters, is that fork-tongued rationale the City fathers use to justify upscale condo towers that practically reach up to Heaven itself. But let us not remember 1723 Napier as we see it now: empty, without windows or walls; awaiting demolition. Let us remember the generations who lived, laughed, loved, created and cried there. They nestled in the embrace of beam and timber, harvested from old growth Douglas Fir — the finest lumber of its time, now all but gone. Are those faithful old timbers headed for the landfill? It is rumored that Tommy Chong (of Cheech & Chong fame) was once a co-owner. So was Bonnie Beck-woman, who also runs a store on the Drive that exemplifies the concept of density in the sheer quantity of stock, shoehorned into every square foot. And so, as we mourn the passing of 1723 Napier, do we also mourn the passing of our East Vancouver? Are we now seeing a new era where the City gates are only open to those who can afford the down payment? We watch this generation of rambling houses, once sheltering many households replaced by upscale lifestyle spaces for young, upwardly mobile urban professionals. Oh! The hubris of Man! Dwelleth close to the earth, with thy brothers! Dwell not in the sky, in cells of gold! Woe to he who celebrates the demolition of these affordable, green, heritage homes! Woe to he who builds not shelter for his brothers and sisters, but shelter for his investments and those of his fellow speculators. Let us pray, yes, but let us also be angry – and may our anger be righteous! Let them hear in City Hall not the splintering of old timbers, but this congregation’s clarion call for social justice! Let this not be a world for the landed gentry alone, but for us all. Ashes to ashes, sawdust to sawdust. I have attended many such funerals in my time, as I used to salvage material from doomed houses. Once I was able to build a small house from the salvage of mostly one other house, but that isn’t happening much anymore as the building codes basically make that impossible now, even then it was a nightmare getting it passed because, for example, the old growth floor joists didn’t have a grading stamp from the mill (even though they were so obviously better than anything coming out of a mill now). If it hadn’t been for one particular inspector who “overlooked” things I would have not been able to finish the house. Advocates need to know that the biggest problem is building codes and zoning bylaws and bureaucrats. Sad. Anyone interested in photos of an earlier mock funeral? The one for the Birks Building in 1974? Here. … and a watercolour I painted of it a couple of years ago. Heritage staff at City Hall are aware of the property and have “put a mark on its file” that would flag it to any potential developer making an enquiry to demolish and replace. The lot, which is 33 x 120 feet, is too small to contemplate any sort of multi-family structure, and we haven’t heard of any attempted lot assembly on that side of the street – please let us know if you hear of anybody snuffling around looking to buy up the rest of the block. Under the Heritage Action Plan, the Director of Planning would have the right to deny a development permit for heritage reasons if there is any conditional use or non-conformities involved. Anyway, that’s way off in the future, we hope. The question is whether the new owner will eventually see the building and its grandfathered commercial use as an asset and look for a new tenant that could make it cool, as have Via Tevere at William, Monarchy Boutique at Charles, South China Trading Company at Grant and Figaro’s at 3rd – all former grocery stores. This is only a partial list of the former commercial spaces dotted along Victoria Drive, all of which ought to be retained as they contribute to the uniqueness of our ‘hood. Heritage Vancouver has posted Scott’s on its Facebook page. Grandview’s former grocery stores would make a fascinating subject for a research project and presentation. For example, here’s a 1960s-era city planning department photo from the City of Vancouver Archives of the McLean Grocery on McLean at Napier, showing how bleak and un-vegetated the area once was (so typical of the city’s old neighbhourhoods in that era). Any volunteers to do the research and source photos? Even the torrential rain couldn’t keep us away from the latest meeting of the Grandview Heritage Group last night! We began by reviewing the latest news on rezoning following Council’s approval of the recommendations from the Mayor’s Task Force of Housing Affordability. There was a spirited and articulate discussion that noted the economics of the recommendations are not yet clear. However, a heritage-dense neighbourhood such as Grandview is at peculiar risk from the upzoned designations now allowed at certain distances from arterial roads and shopping areas. Maurice Guibord gave us more details on what will be the first ever historical/heritage walk along the slope west of Commercial Drive. The tour will go ahead rain or shine at 10:00am on Sunday morning. Maurice promises us that it will finish at the Gelato place at Venables and Glen. We also discussed dates for the November talk. In the end (after the meeting) it was agreed Jak King will talk about the early history of Commercial Drive on the afternoon of Saturday 8th December in the Learning Centre at Britannia. Finally, Jak displayed his now completed database of the building stock in Grandview (some 4,100 lots) and the maps and graphs associated with the database. There was a long discussion about the uses to which the database can be put, and the additional data that can be added. The following is an overall map showing the age of the building stock in Grandview: the darker the colour, the older the building. … which shows that 50% of the current building stock in Grandview was constructed by the end of the 1920s. Talk about heritage-dense! Once again it was an excellent meeting with a lot of information and ideas shared. Here is Allan Garr’s opinion that the STIR program has not brought affordable housing to Vancouver. Given the assumed change in planning philosophy, this needs to be kept in mind. This next piece is from the Economist and discusses the feel of streetscapes and crowd dynamics. 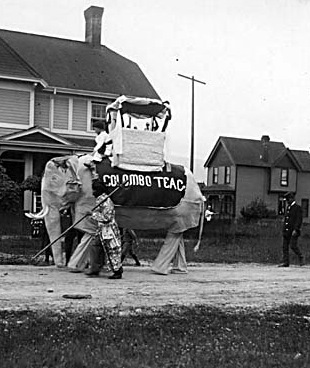 Finally, City Archives came up with this wonderful photograph of an imitation elephant on Burrard in 1900.